Medical Care Alert is a Michigan-based provider of personal medical alert systems and monitoring services. Whether you spend the majority of your time at home indoors, in the yard, running errands or traveling, Medical Care Alert has a system to ensure you can get help if you need it. The pendant and wristband emergency buttons are waterproof for continuous everyday use. Medical Care Alert offers five personal emergency response systems offering immediate access to help with the push of a button. Check out our top picks for the best medical alert systems by clicking the link below. Medical Care Alert has been keeping people safe for a decade by providing instant access to highly trained and certified emergency personnel 24 hours a day, every day of the year in U.S.-based offices. Medical Care Alert offers five different personal emergency response systems with immediate access to help after pushing a button. There is no equipment to buy and no long-term commitment, with costs as low as $1 a day. Medical Care Alert‘s monitoring service keeps records of your home location, medical conditions and current medications to provide to emergency services personnel. The emergency operator will call or text your loved ones and caregivers in the event of an emergency. Your contacts can reply via text or phone to let the monitoring center know they are on the way to help you or to request additional help. Medical Care Alert offers five medical alert systems. The wireless models run on AT&T’s cellular network with the cost of using the service included in the subscription price. The landline and wireless models use a base unit in your home with a two-way speaker and either a wristband or pendant with an emergency button. The wristband and pendant are watertight and can be worn while bathing. The GPS-enabled systems, HOME & AWAY ELITE and PRIMO, come with a small mobile device with an emergency button and a two-way voice pendant that you can also use for taking phone calls. HOME Medical Alert System: A landline-based model for use inside the home. This system includes a base unit with a powerful microphone and a speaker with volume control. HOME 3G Wireless: Uses a cell signal for communication. No landline required due to a similiar base unit like the HOME Medical Alert System. HOME & YARD: A landline-based model with a two-way communication pendant. You can take phone calls using the pendant as well. HOME & AWAY ELITE: A small mobile device with the emergency button worn as a pendant or using a belt clip. HOME & AWAY ELITE utilizes GPS to locate you should you need help from just about anywhere in the United States. This device uses cellular communication. HOME & AWAY PRIMO: Uses GPS, Wi-Fi and cellular services to find you faster, and you can locate the mobile device online if you lose it. The optional Medical Care Alert Fall Detection pendant can automatically call help if you lose your balance and find yourself on the ground. This service costs an additional $10 a month and comes with a pendant featuring two-way communication and a sensor that analyzes movement to detect falls. If the system determines a fall has occurred, a call automatically goes through to a Medical Care Alert emergency operator in 30 to 45 seconds. If you should fall and can push the emergency button, you should do so. If you subscribe for a year of service, you receive one month free and you will be locked into your subscription rate so you won’t pay more in years to come. Medical Care Alert gives you 14 days to try a system at no cost. There are no cancellation fees, and if you’re not happy with the system, you can return it for a refund within the 14-day trial period. Warranties: Medical Care Alert equipment comes with a free lifetime replacement warranty for normal wear and tear. The company is responsible for all service or repairs and provides lifetime battery replacements. An optional extended warranty program covers Medical Care Alert bases and wearables against electrical damage, lightning strikes, and power surges. There are some deductibles involved with most equipment. Returns: If you decide to return your Medical Care Alert system, you will receive a refund with a prorated amount of prepaid service and subscription fees based on the date you ship the equipment back. If you did not use the equipment for at least 14 days and did not at least test the system, there is a $50 programming and restocking fee. The Better Business Bureau gives this BBB-Accredited business an “A” rating and lists two consumer complaints against the company. TopTenReviews rates Medical Care Alert 8.5 out of 10 stars, deducting points because operator support is available in only two languages (English and Spanish). ConsumerAffairs rates the company 3.4 out of 5 stars, noting that they have a 96 percent customer satisfaction score. A few complaints we found centered around returning equipment and Medical Care Alert claiming there was damage when the customer felt there was no damage. This resulted in an unwanted extra charge. Other complaints talk about the devices being uncomfortable to wear. Who manufactures Medical Care Alert equipment? Bosch, a leading German healthcare manufacturer that has been in business for over 50 years, makes all Medical Care Alert system components. Can one Medical Care Alert system protect multiple people in a single household? Yes, if you use a HOME system. There is no additional monthly charge to monitor more than one person in a household, but each person will need to have their own personal medical alert wearable emergency button. The additional pendant or wristband is subject to a one-time cost depending on the model you choose. Since the HOME & AWAY systems use GPS, each person must have their own mobile device. 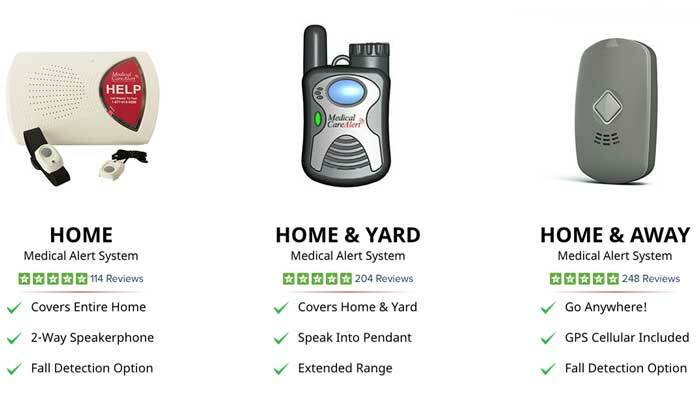 Medical Care Alert offers a couples discount for the HOME & AWAY systems to help defray the cost. What training do Medical Care Alert operators have? All Medical Care Alert emergency operators must pass a thorough six-week training program certified by the Security Industry Association (SIA). Training consists of two weeks of formal classroom training followed by two weeks of operations training. New hires go through two weeks of hands-on training while being closely monitored by supervisors. The Medical Care Alert program is the most stringent in the medical monitoring industry. Do I have to pay a fee when I push the emergency button and connect to an operator? No. Medical Care Alert does not charge any fees for operator assistance, and the company also encourages customers to test their emergency buttons weekly by pressing them and speaking with an emergency operator. What will happen to my Medical Care Alert system if the power goes out? Every Medical Care Alert system comes with a backup battery that will last between 24 and 72 hours, depending on the model you buy. If there is a power outage or the backup batteries are low, a monitoring center operator gets a notification and will check on you. The base unit stops notifications when power is restored, or you replace the batteries. The sense of security that comes from knowing help is just a button push away is priceless for maintaining your independence as you age. Medical Care Alert systems can give you that peace of mind and the price will never go up. Furthermore, the company’s award-winning service and high-quality equipment make them a viable contender when you are considering a personal medical alert system. If you’re interested in learning more about Medical Care Alert products, call (888) 302-4415 or visit their website for more pricing information.